« You Ran What For Fuel?! This is the header where all the fuel lines connect…you may recognize it…unfortunately MOST FOLKS do not, because they have never crawled under their truck to drain the water separator…that plug with the hex in the center…that is where the water is drained from the water/fuel separator. 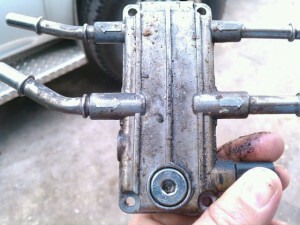 This is where the primary fuel filter is located also. I am AMAZED by how many people do not change the fuel filters often enough, and even MORE amazed at how many change the secondary fuel filter under the hood but think it’s acceptable to NOT change the primary under the truck…it’s bad enough when you don’t do it often enough, but even worse to neglect the primary filter when you FINALLY DO decide to maintenance the truck…and even WORSE YET if you are late on the filter changes, don’t change the lower filter every time you do the upper, but it is a grave error if you do not take a hex wrench and open this drain…. 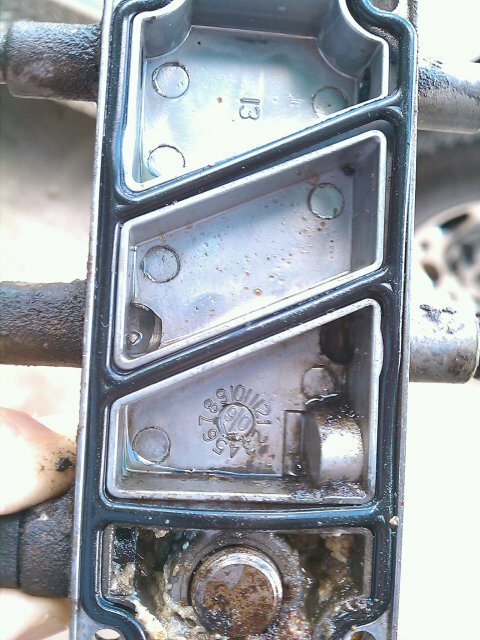 This is the back side of the fuel header….that is the back side of the drain plug you see in the center all the way at the bottom….. 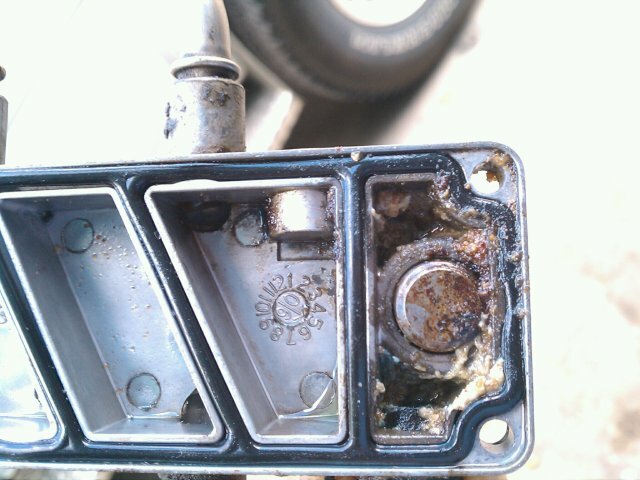 Here is a close up of the drain plug…..see all that gook and corrosion in that lower cavity (on the right)….THAT is fuel injector death right there! 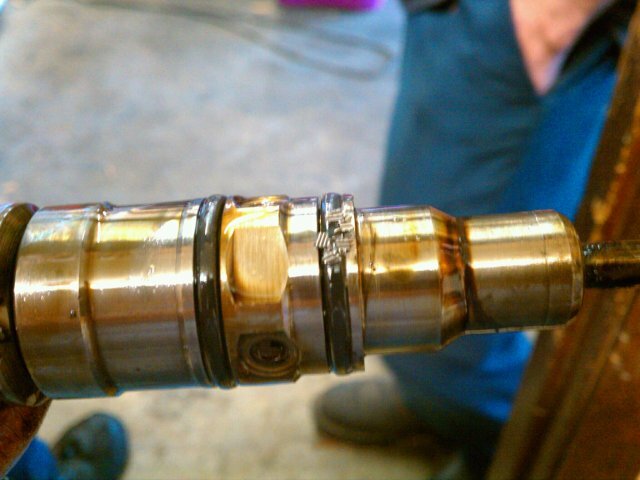 The water in fuel sensor (WIF) is in this same cavity…if you do not service the water/fuel separator and filters as often as you should, it will become corroded like this……very bad news for your fuel injectors. If you have a WIF light that very seldom or never comes on, you need to get the truck to us ASAP…..or if your water in fuel light came on and you DID drain the separator, and the light soon came back on, and you repeated this process a few times and you finally said “oh well, I’ll just ignore the light”, you need to get it to us ASAP. If you are simply guilty of not changing your fuel filter every 6-8 months or not draining the water separator every 45 to 60 days, you NEED to get it to us ASAP. The biggest mistake people make with the 6.0L and newer trucks is that they assume the truck can be maintenanced the same as the 7.3L trucks…..and it just is NOT so. The water/fuel separator should be drained a MINIMUM of 6-8 times a year whether the light has come on OR NOT, and the filters should be changed 2-3 times a year…..and MILEAGE put on the truck is IRRELEVANT! 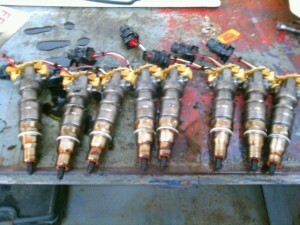 If you don’t want to risk over $2000 worth of fuel injectors (not incl. labor) and you were not aware of the above (they don’t tell you when you buy the truck) then you reeeaaallyyy need to get it to us ASAP…..odds are this fuel header/WIF sensor assembly needs IMMEDIATE replacement at best and possibly even the entire FCM needs replacement. 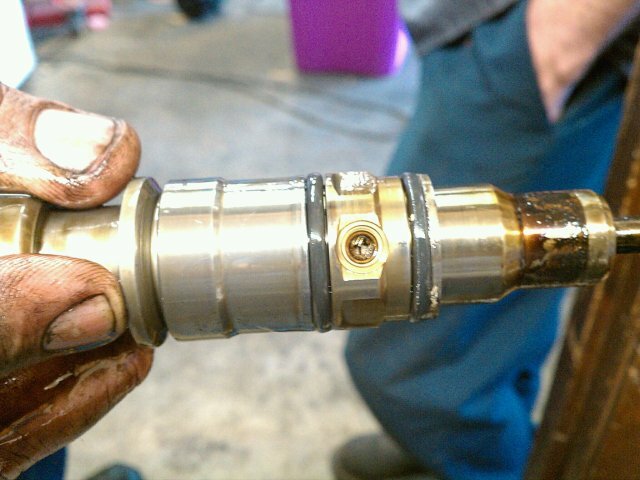 I JUST WROTE AN ESTIMATE on replacing ALL EIGHT injectors AND the low pressure fuel pump, AND the injector pump on a 2014 truck with LESS THAN 30,000 MILES ON IT that the dealer DECLINED TO WARRANTY due to NEGLECT, so this applies to YOU TOO if you have ANY 2003.5 through 2015 Powerstroke Diesel, not just applicable to the 6.0L!!!! This is an EVEN BIGGER issue on the 6.4L AND the 6.7L as well. 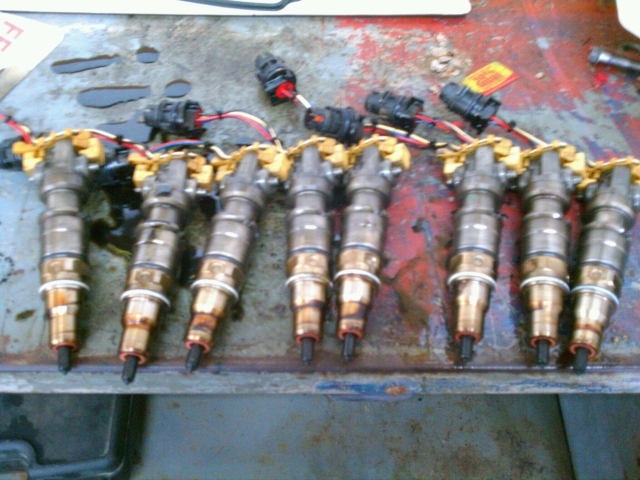 Here is the last set of 6.0 Injectors we replaced….a few folks cannot understand how all injectors can be bad, but give it some thought…they ALL are the same age…they ALL have the same miles on them…they ALL have had the same crappy fuel go through them….so LOGICALLY, how CAN a couple of them be bad and the rest are FINE???? It cannot happen…even if one of these is not causing a dead miss right NOW, it will tomorrow…or next week…or next month…anyone’s guess when…but an EDUCATED and EXPERIENCED guess would be “NOT LONG”…….especially considering the lack of maintenance that causes this failure that was shown above….check out the following pictures….. 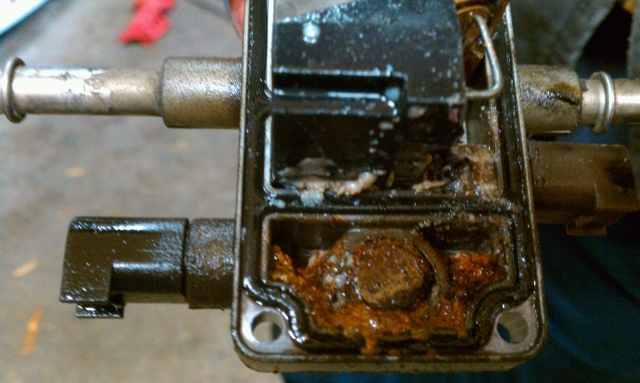 This is the fuel pump/fuel filter/water separator – FCM (fuel conditioning module) assembly that mounts in the frame rail on the driver’s side…..you know….the one that when we get a truck come in running like crap with bad injectors and we examine this setup, we find that some lube shop techs have been throwing away the primary filter that goes in here and changing only the easy engine mounted filter because they don’t want to get diesel in their armpits or because the cover on the filters are usually stuck beyond belief so they just don’t feel like messing with it…….yeah, that assembly….the SAME one that YOU should be opening the drain on every 45 days or more often…or bringing it to us for routine maintenance so it will get done. See that crud in the housing? See that crud laying on the red rag to the left of the photo? The second picture is a close up shot of the crud in the housing. Well that crude is fuel injector DEATH. 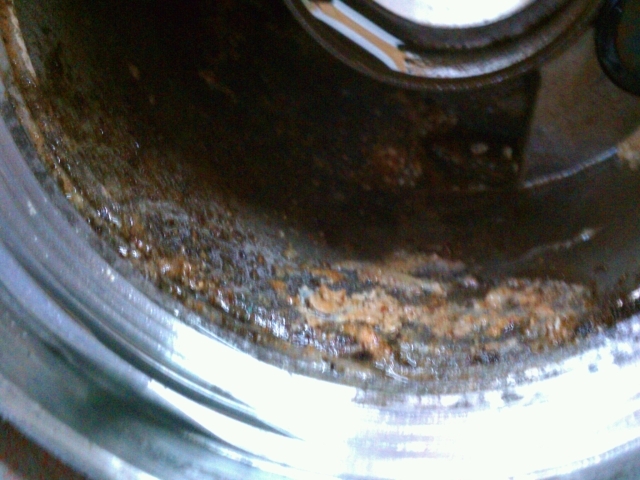 See that crud in the area of the drain? See the crud in the area above that? This amount of crud is not UNCOMMON…..it is not limited to the trucks that were owned by folks that did NO maintenance….this happens when you THINK you are doing it often enough, and this happens when you ARE bringing it somewhere for maintenance and it is not being done PROPERLY…..
See that screen on the side of the injector in the center of the photo? 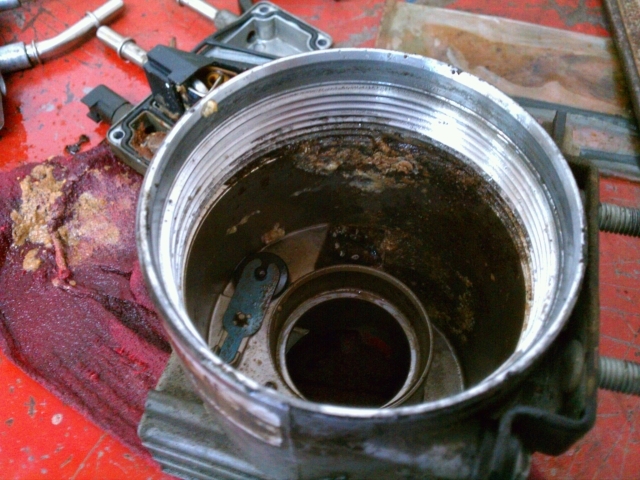 The one ripped apart…..the one with the crud in there…..See those pieces of blown out screen that was in the fuel passage? 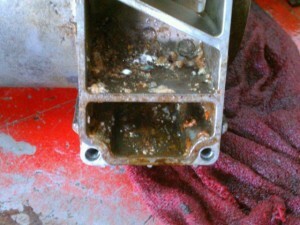 The screen blown out by the crud….the screen mixed with crud that is now blowing out screens on ANOTHER injector….that will then become MORE screen and MORE crud that will blow out the screens on 6 MORE injectors…..
ALL because the little clown at the lube shop did not want to do his job, or because you did not KNOW that you should have been draining that separator frequently…..These injectors go south in a few different ways. They can cause missing and power loss when the engine is cold and then as it warms up, it runs better and better….in this situation, as more and more of them get worse, eventually the engine will run worse and worse for longer and longer after start up. Or they can go bad in such a way that the engine will start and run great, but as it gets warmer 1 cylinder will drop…then 2…then 3 and by the time the engine is fully warmed up a 4th drops out….then finally the engine quits and leaves you on the side of the road….let it sit for a few minutes and you can start it back up and go a little ways and it happens again…this is due to combustion gases entering the fuel system through a faulty injector and filling the fuel with air bubbles. Or they can go bad in such a way that you have a dead miss and raw diesel coming from the tail pipe. Or they can split the tip and damage the engine internally, as is much more common on the 6.4L and the 6.7L. Yes….faulty injectors CAN and DO cause engine damage in a LOT of cases on the 6.4L and the 6.7L, and on the 6.4L and 6.7L engines the fuel system neglect generally takes out the HPFP (injector pump) first and the HPFP then scatters pump innards downstream and ALSO kills all 8 injectors and one of those injectors CAN and sometimes DOES kill your ENGINE! Seriously folks….you REALLY need to let someone that KNOWS these engines do the routine maintenance on them, not just the repairs….EVEN IF it is more inconvenient for you leaving your vehicle with us for a half day…..EVEN IF it costs a little bit more…..and EVEN IF we ell you it needs to be done WAY more often. On these trucks that WE have done the service and the customer did EVERYTHING when WE said to do it, they are still ticking along fine…..but on the OTHER HAND, on some 6.4L and 6.7L trucks we have had to replace the low pressure fuel pump, the hig pressure fuel pump AND all eight injectors on trucks as new as THREE YEARS OLD in cases where the customer either did not know what needed to be done and how often, OR was taking it to a quickie shop and what they were paying for was NOT getting done….or being done with the wrong parts….or not OFTEN enough….or a combination of everything. The 6.0L, the 6.4L and the 6.7L are ALL good engines….GREAT engines in fact…..but they CANNOT be treated the same as the old 7.3L….they are “higher tech”, but most folks do NOT realize the “high tech” also means it will have MUCH LESS TOLERANCE for NEGLECT and much less tolerance for a technician’s lack of KNOWLEDGE and experience……………..